Mohave Community College’s dental hygiene clinic is offering free dental services to children ages 4-14. 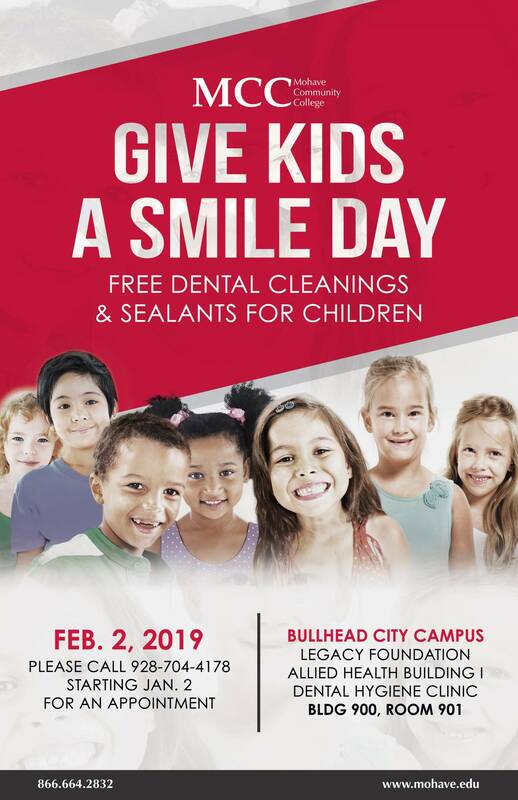 Children will receive a free teeth cleaning, fluoride treatment, sealants and oral hygiene tips. Call 928-704-4178 and make an appointment today! Space is limited! This charitable giving day is part of the Give Kids a Smile initiative, created by the American Dental Association 15 years ago to reduce school absenteeism by eliminating oral pain. Give Kids a Smile is held statewide in February to recognize National Children’s Dental Health Month and to build awareness of children’s oral health issues and unmet need. MCC dental hygiene students have been participating in the program for over 10 years. More than 60% of children have untreated tooth decay Nearly 30% of Arizona’s children have untreated tooth decay (urgent defined as swelling, pain, infection). School age children are more likely to have tooth decay than asthma, hay fever or chronic bronchitis.